As I reported earlier, final maps drawn by the CA redistricting committee has upended Congressional districts all over the state, including our own CA-36, where newly-elected Congresswoman Janice Hahn finds herself in the luckless position of being drawn out of the district she won just two weeks ago. What's gotten less attention, however, is the state of play going on in the newly drawn Assembly districts. The WeHo news is reporting this weekend that Assembly Member Betsy Butler, who currently serves AD53 - which stretches from Venice to Torrance - is already planning to move out of the district to run for an open seat in the new AD50. According to political observers, the Democratic Party has two goals; keeping incumbents from facing one another and to shoot for a two-thirds majority in the legislature to craft budgets that befit Democratic ideals. Ms. Butler is expected to move a few blocks north and to announce for the newly-created district. It's an interesting choice for a couple of reasons. Butler could have chosen to move south, in the new AD66, which includes the Beach Cities and Torrance, areas she already represents. But this new district will be more conservative than AD53 - Democrats have only a 3-point registration advantage over Republicans. Without Butler competing for the seat, her move means a likely Republican pickup in the Assembly. The new AD50 is far friendlier to Democratic candidates, with an overwhelming Democratic registration advantage. However, those friendlier demographics don't guarantee Butler will be reelected to the Assembly. Although a sitting Assembly Member, Butler won't have the benefits of incumbency in her chosen district. She'll be facing off against against a number of candidates already running for the seat who have strong ties to the district, including front-runner Torie Osborn, who's reportedly raised nearly 300K, and has been endorsed by the district's termed-out Assembly Member Julia Brownley, former Assembly Member Sheila Kuehl, LA Mayor Antonio Villagairossa, and a number LA Councilmembers, including Counclilman Bill Rosendahl, who previously endorsed Betsy Butler in 2010. The Commission will be voting on the final maps on August 15. Janice Hahn On Redistricting, " I Don't Know What I'm Going To Do"
If the final CA congressional redistricting maps survive legal challenges, newly-elected Congresswoman Janice Hahn will find herself between a rock and a hard place or, more specifically, between 36-year Congressional veteran Henry Waxman and angry African-American constituents. The new maps redraw Hahn and her hometown of San Pedro into a new "Gardena-Compton" district tailored to represent African Americans. The district she currently represents, CA-36, would hug the coast from Palos Verdes in the south to Santa Monica, Beverly Hills and Malibu to the north - the majority of Henry Waxman's current district. According to the LA Weekly, African American activists are already sounding alarm bells over the prospect that Hahn could potentially cut their SoCal representation in Congress from three seats to two. In an email making the rounds today, activist Basil Kimbrew accuses Hahn of having "disrespected and betrayed the black community." Kimbrew claims that Hahn told him she will run for the Gardena-Compton seat, which also includes Hahn's home in San Pedro. Kimbrew goes on to say that African-Americans who worked to elect Hahn in her special election were "duped" and "tricked" -- and would have been better off supporting Secretary of State Debra Bowen. In another article, Hahn sounded none too happy with the situation. If Hahn did chose to run in the new Gardena-Compton district, she'd also be facing off against CA Assembly member Isadore Hall, who's announced his intention to run in the district and has already racked up a number of community endorsements. Hall and Richardson could potentially split the African American vote and allow the well-funded Hahn to make it to the general election under California's top-two primary system. The Commission is schedule to vote on the adoption of the maps on August 15th. 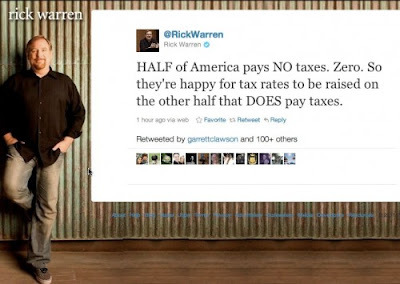 Rick Warren, who's Saddleback Church enjoys tax-exempt status, went on a bit of Twitter rant last night, tweeting that low-income Americans pay no taxes, and by inference, are a burden on those that do. One can argue whether or not the Pastor's tweet was the Christian thing to do, but what's not up for debate is this: low-income Americans certainly do pay taxes, and at a far higher rate than Americans in the upper income brackets. In 2009, nearly 47% of American taxpayers paid no Federal Income tax, either because they didn't make enough to qualify, or because of deductions like child care credits that eliminate their liability. However, those individuals, if they work, pay Social Security and Medicare taxes. If they don't, they still have to pay sales taxes, one of the most regressive taxes there are. 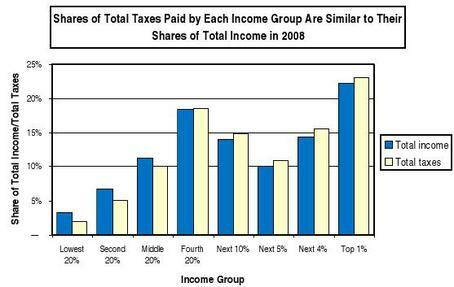 For instance, in Washington State, a 2003 study by the Institute on Taxation and Economic Policy found that the poorest 20 percent of Washingtonians pay 17.5 percent of their income in taxes each year, while the top 1 percent pay just 3.3 percent. Washington State has no income tax, relying instead on a 6.5 percent sales tax for funding. In addition, depending on their state and circumstances, many lower-income Americans also pay car taxes, gas taxes, utility users taxes, telephone excise taxes, as well as so-called "sin taxes" for tobacco and alcohol. If they own property, they pay sales taxes, if they rent, chances are their rent probably covers their landlord's property tax - who receives a mortgage interest tax deduction--a deduction which the renter does not benefit from. And, as states tighten their belts, lower-income Americans wishing to seek higher education end up paying higher taxes in the form of increased student fees at state colleges. Rick Warren's deleted his tweet sometime in the middle of night after it went viral, complaining that detractors were "just looking for a fight, not clarity." Well, Pastor Warren, here's some clarity for you. Here's another moment of clarity. In a 2009 article for The Nation, John Weiner detailed how Rick Warren used his considerable political clout to get out from under an 1996 IRS investigation for illegal exemptions. The IRS permits members of the clergy to claim exemptions for their housing. At the time of Warren's audit the amount claimed had to be "reasonable"--it shouldn't exceed the fair market value for the rental of the home. That 1996 audit concluded that Warren was deducting more than that--the IRS said he owed it $55,300. Warren challenged the IRS in tax court, arguing that his housing exemption should be unlimited. In 1993 Warren deducted $77,663, his entire Saddleback Church salary that year, as a housing expense--and paid no taxes at all on that salary. In addition, he claimed a deduction for his mortgage expenses--even though they had been covered by the salary. He made similar claims in subsequent tax returns. When the IRS tried to collect back taxes on the exemptions, Warren took them to court. In May 2000, the court struck down the IRS's "reasonable" clergy-housing cap, accepting Warren's argument that a clergy's housing claim could be unlimited. The IRS appealed, and the case went to the Ninth Circuit. That court declared that it wanted to consider not only whether the IRS had been right in trying to limit Warren's tax deduction for housing but also whether the tax break for clergy housing violated the establishment clause in the Bill of Rights, which requires separation of church and state. Then things got interesting. The Ninth Circuit never got to make the determination. Congress stepped in--and acted with "almost miraculous" speed, as Richard Hammar, editor of the Church Law & Tax Report newsletter, explained to the New York Times. The new law granted Warren his deductions... Congress also put into law, from that time forward, the IRS's "fair rental value" rule. The Clergy Housing Allowance Clarification Act of 2002 was approved unanimously by Congress, then signed into law by George W. Bush on May 20, 2002, rendering the IRS case against Warren moot. "I have filed hundreds of briefs in federal courts," Chemerinsky told me, "and this is the only time that Congress passed a law to make a specific pending case moot." He added, "It is very rare for Congress to pass a law to make a pending case moot before there was a decision." Who would Jesus tax? Well, according to Rick Warren and his friends in Congress, not him. BREAKING: Janice Hahn Signs On To Progressive Caucus Letter: "I do not support cuts to Social Security"
Our newest member of Congress, Janice Hahn, wasted no time after being sworn in today. Signing on to the Congressional Progressive Caucus letter to Nancy Pelosi pledging to oppose any deal that cuts Medicare, Medicaid and Social Security. Hahn's signature brings to 15 the number of California congress member signatories. Last week, in her first post-election interview, Hahn indicated she'd be willing to compromise on Social Security cuts, saying "Americans want us to get together and come up with common sense solutions... If compromises need to be made, I will certainly follow the lead of the President." Hahn's statement prompted concerns in the districted, and motivated Venice For Change to partner with progressive activist Asher Huey to petition the congresswoman to sign on to the Progressive Caucus letter. Nearly 200 of her constituents signed on to the petition. Every signature prompted an email that went directly to her office. Less than 24 hours after the petition went live, Hahn signed on to the CPC letter. Congresswoman Hahn has also pledged to join the Progressive Caucus, and will make a statement once her membership becomes official. Venice For Change thanks the congresswoman for acting swiftly to address the concerns of her constituents. We look forward to helping her shape a progressive agenda for our community in the months and years to come. When Janice Hahn campaigned for Congress, she attacked her opponent for supporting cuts to Medicare, Medicaid and Social Security. She said she would be "A true fighter for working families." Yet, in her first interview after the election, Hahn opened the door to cutting these programs at a time when working families may need them the most. "Americans want us to get together and come up with common sense solutions... If compromises need to be made, I will certainly follow the lead of the President." Essential programs such as these should not be on the table. The Congressional Progressive Caucus is sending a letter to Nancy Pelosi pledging to oppose any deal that cuts Medicare, Medicaid and Social Security. So far, 14 California congress members have signed on. Following the lead of the Progressive Change Campaign Committee, Venice For Change is partnering with progressive activist Asher Huey (yes, ironically, son of Craig Huey), to ask our newest member of Congress to sign on to the letter and stand up for everyone who relies on these vital programs. Sign on to our petition and make your voice heard. When you click on this link and sign our petition, Janice Hahn will receive an email directly from you, asking her to be the fighter she promised to be during the campaign. If we flood Hahn's inbox with letters over the next few days, we can make our voices heard loud and clear - when it comes to Medicare, Medicaid and Social Security, we can't afford to compromise on our future. 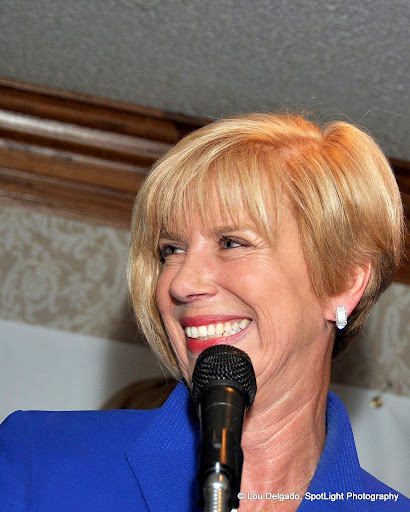 Sign on to our petition and tell Janice Hahn we need her to be the fighter she promised to be. The newest member of Congress could be among the most adversely affected by new political maps currently being considered by the state's redistricting commission. 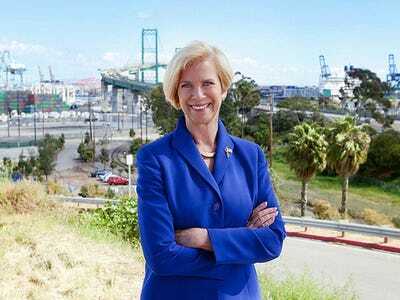 Democratic Congresswoman-elect Janice Hahn of San Pedro could find herself in a new district that runs along the coast from the South Bay to Malibu, and stretching inland to grab parts of West Los Angeles and Beverly Hills. Much of that district is currently represented by Rep. Henry Waxman. The other option for Hahn is a Long Beach district that has none of her South Bay political base and also includes two other Democratic incumbents -– Reps. Linda Sanchez and Laura Richardson. Democratic consultant Paul Mitchell, who has been actively monitoring the redistricting process, says Hahn could be “in serious trouble." "She’s losing the seat that she just won,” Mitchell said. Mitchell says that under new working maps released by the commission this week, the number of Latino seats in Los Angeles is likely to increase, while one of the basin’s three African American congressional seats could disappear. Here's what happened: The California Citizen's Redistricting Commission just released a third version of their "visioning" maps for Congressional and State Assembly Districts. And as indicated above, these new maps are radically different from anything we've seen before. There are three different proposed versions of CA-36. Depending on which option you chose, our newly-elected Congresswoman Janice Hahn could end up sharing her district with Henry Waxman, or she could even end up outside the district. All of the options include everything from Malibu to Rancho Palos Verdes, while cutting the Beach Cities - Redondo, Manhattan, Hermosa and Torrance - in half just west of the 405 freeway. Click here to see version One. Click here to see version Two. Click here to see version Three. To see more detailed congressional maps, go to this link, type in your home address, then go to the "Select District" pull-down menu, and select "congress la opt1, opt2, or opt3"
The new Assembly districts in Southern California aren't much better. My Assembly district, AD53, is now partially divided into three separate districts, with Venice as the nexus. Which means that Venice - 1 square mile wide - could potentially be represented by THREE different Assembly members. To see the new Assembly map, Go to this link, type in your home address, then go to the "Select District" pull-down menu, and select "assembly la opt1"
Don't like these maps? Want Venice to stay in one district? (I know I do). Don't want your town represented by two different congress people? The Commission needs to hear from you. Send an email to votersfirstact@crc.ca.gov and let them know what you think. Be sure to put down where you live so they know you're a constituent! Right wingers file ballot initiatives to end collective bargaining rights in California. Whether California Center for Public Policy, led by UC Santa Barbara economics lecturer Lanny Ebenstein (right), can raise enough money to put the proposals before voters is unclear. The center released a report last year concluding that voters need a chance to resolve California's persistent fiscal problems by cutting government workers' compensation rather than raising taxes and eliminating services. "Government does not exist to provide compensation and pensions for government workers," Ebenstein said in a news release. "Government exists to provide good public services at a reasonable cost." He said he filed the three initiatives Tuesday with the state attorney general's office. The first measure would ban recognition of all public-sector labor unions and prevent government authorities from collectively bargaining with them. The second would impose a higher tax burden on pensions paid through CalPERS or CalSTRS. Someone who earns an annual pension of $100,000 to $150,000 would pay 15 percent above the regular state income tax on the pension. The rate would jump to 25 percent for any pensions above $150,000. Health benefits would not be considered in the calculation. Ebenstein said the tax would eventually raise $1 billion a year for the state. The third would raise the retirement age for state employees to 65. Public safety workers would see their retirement age rise to 58. A spokesman for a public employee group said he doubted Ebenstein's group could raise the money needed to campaign successfully for the three measures. "These will end up in the same trash bin as the proposal to require Christmas music in public schools," Steve Maviglio of Californians for Retirement Security said in a statement. "These proposals are wildly out of sync with California, and fortunately there's a $15 million gap between dumb ideas and the ballot box." Once the attorney general's office writes legal summaries for the measures, the group will need clearance from the secretary of state's office to begin collecting signatures to place it on a ballot. The signature-gathering process would cost at least $1 million for each measure, Ebenstein said earlier this year. Ebenstein's fundraising committee has yet to solicit any donations, but he said Wednesday he would use the next few months to speak to people across the state from both parties who have made large donations to past initiative campaigns. If the latter two measures qualify for the ballot, they could end up tangling with other proposals on pension reform, including one being considered by the Legislature. With only four days to go in one of the most negative and contentious elections we've ever had here in CA-36, I'm happy to report there's light at the end of this tunnel - and it's not an oncoming freight train. Early voting numbers are looking very bad for Craig Huey. According to John Shallman, a campaign consultant working with Janice Hahn's campaign, Hahn is up by nine points in early voting once Decline To State votes are factored in. If accurate, this news is very good indeed since it would be very difficult for Huey to overcome that margin on election day, especially in this district, where Democrats hold an 18-point registration advantage. Worse for Huey, he's receiving no institutional support from the Republican Party. According to Politico.com, he's received only one $5,000 check from the NRCC. "I was anticipating a lot of support from the RNC and NRCC, that they'd wake up, but frankly we haven't seen that," said Jimmy Camp, a Huey adviser. "Frankly, that's disappointing." Of course, all of this is meaningless if you don't go out to vote. If you have an absentee ballot and haven't returned it, get it in the mail today, or else bring it with you to your polling place on Tuesday. Don't know where your polling place is? 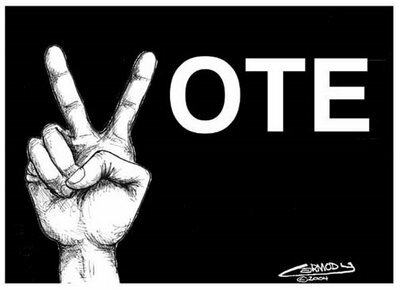 Go to http://www.lavote.net/LOCATOR/ to find your polling place.